As Sea Turtle nesting season draws to a close around this time of year, we can reflect on how wonderful it is that our beaches are a destination for Sea Turtle species to lay their eggs. The safety and success of those nests depends largely on dedicated volunteers who patrol the beaches looking for signs of a nest, block off areas of the beach where a nest is suspected or has been confirmed in order to protect the nest, and help the hatchlings make their way safely to the sea. These volunteers are active in the early morning hours, before most of the beach-goers arrive on the strand, looking for signs of "turtle prints" leading from the dunes to the water. 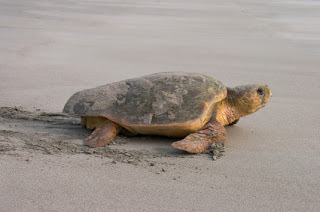 Female Loggerhead Sea Turtles make their way to our shores in the nighttime between May and August, creating a nest deep in the sand up by the dunes and depositing up to 120 eggs in their nest before heading back to sea. Volunteers turn out in the first morning light to look for signs of sea turtle tracks in the sand. Once the beaches start filling up with visitors and the tide starts moving up, these tracks are easily erased and the sea turtle nest can go undetected. If a potential nest is spotted, volunteers can stake out the nest area and do everything they can to ensure it's protected. This is such an important job because of how busy our beaches become during Sea Turtle nesting season. Wrightsville Beach and southeastern North Carolina is privileged to be home to the Karen Beasley Sea Turtle Rescue and Rehabilitation Center. This organization helps coordinate Sea Turtle Volunteers throughout the area and works so hard to protect nests and hatchlings and rehabilitate sick or injured sea turtles for release back to sea. We are even home to a Sea Turtle Marine Biology Camp for teens to come and learn about Sea Turtles and coastal marine sciences.